Clipping defines the area of an element that will be visible. First set the position property of the element to absolute. If you have a fixed webpage lay out, this should work fine. But if your webpage elements need to follow normal "flow", you'll need to nest the clipped absolute positioned element inside another element with position set to relative. This allows the clipped element into flow into position when the webpage is rendered in the browser. 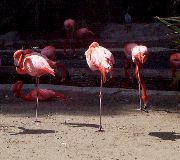 A clipping rectangle was applied to the span containing the flamingo image so that only the first flamingo is visible. • Note that the order of values passed to the rect function is not the standard left, top, right, bottom. Instead it's: top, right, bottom, left. Even though you defined the containing element as position:relative, because of a bug in most browsers, including Internet Explorer and Mozilla, elements after the span will not flow properly unless you set a width and height for the containing element.